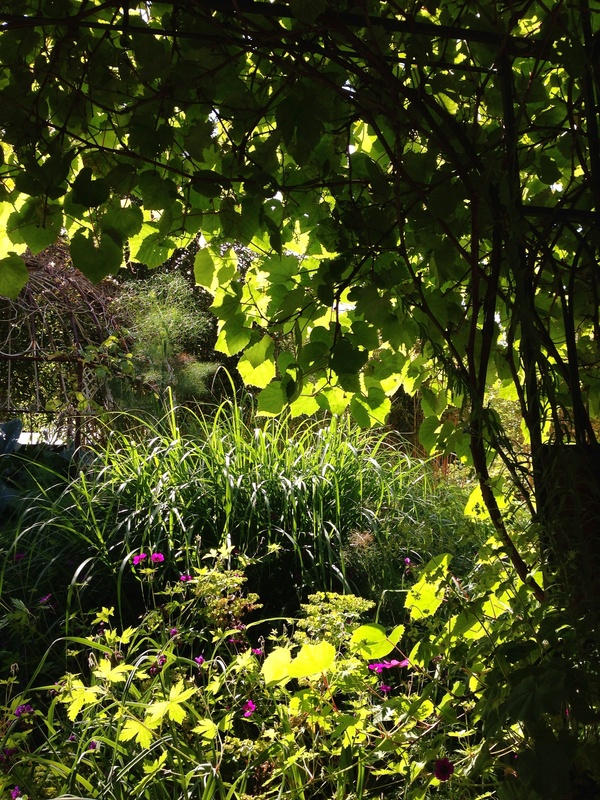 What does a grassy garden look like in midsummer? 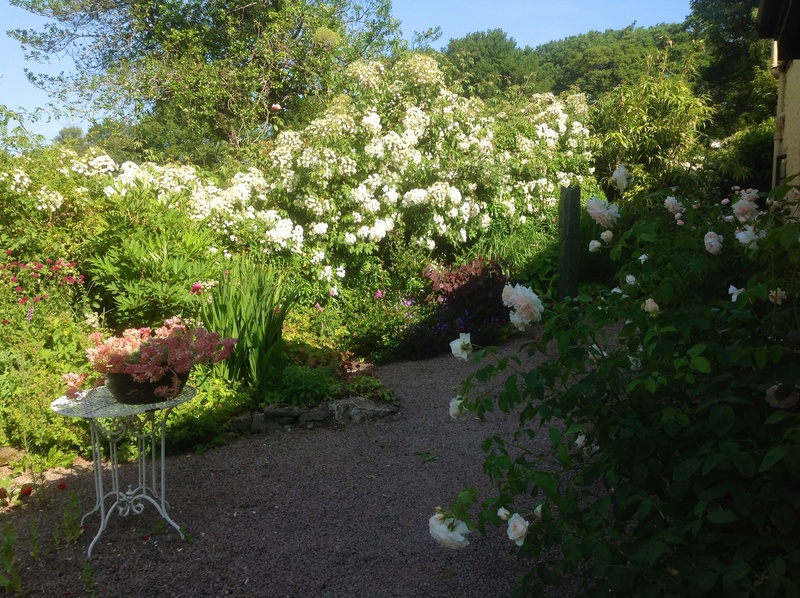 Here are a few garden highlights we hope visitors will enjoy in June, the gates open at 2pm on Sunday 21st June for Barn House’s midsummer NGS day. 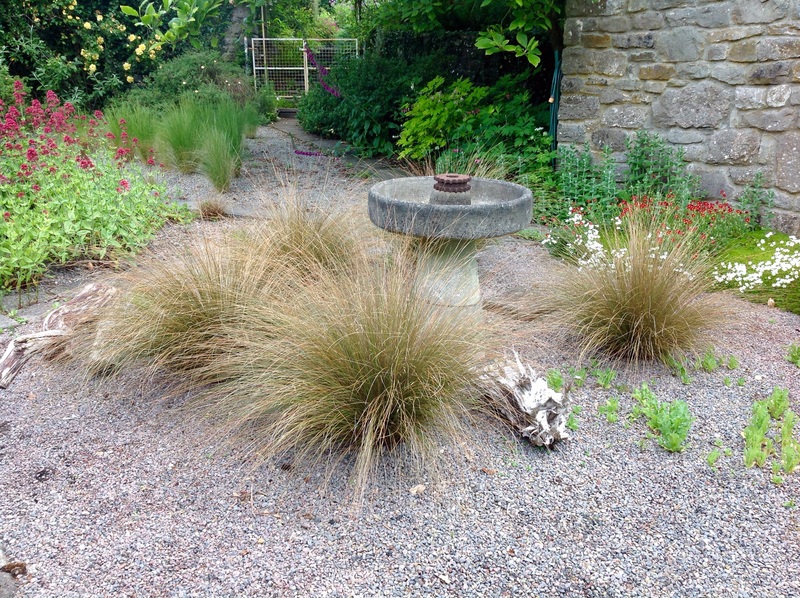 Stipa gigantea basking happily in the front garden, all their own doing, this spot was their last chance saloon before the compost heap. 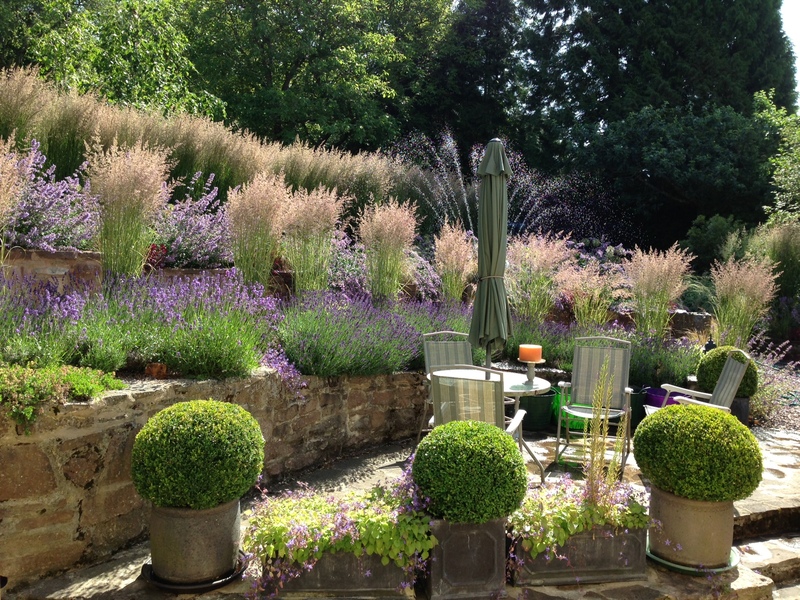 A mass planting of two varieties of Calamagrostis xacutiflora ‘Karl Foerster’ and ‘Overdam’ in the grasses terrace in front of the house, in Wimbledon colours. 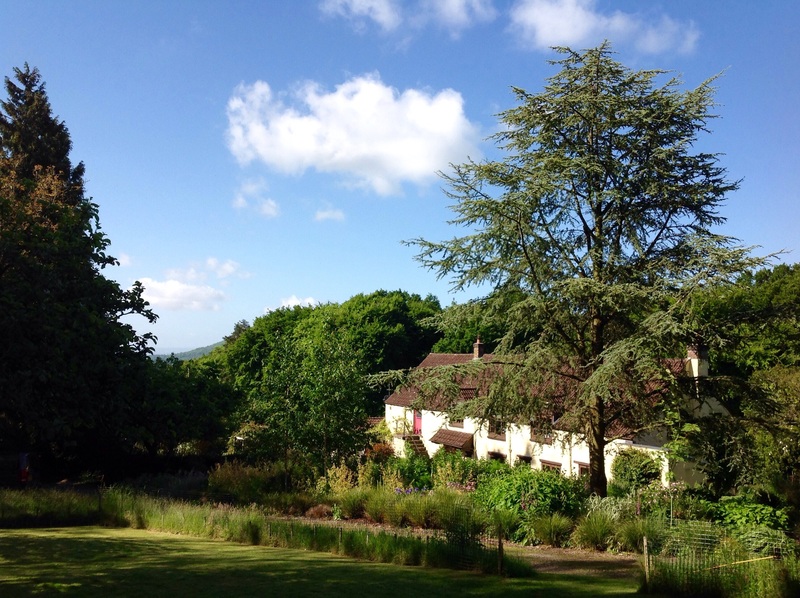 Usually Calamagrostis is in full flower by midsummer, but this year it seems to be keeping us waiting. 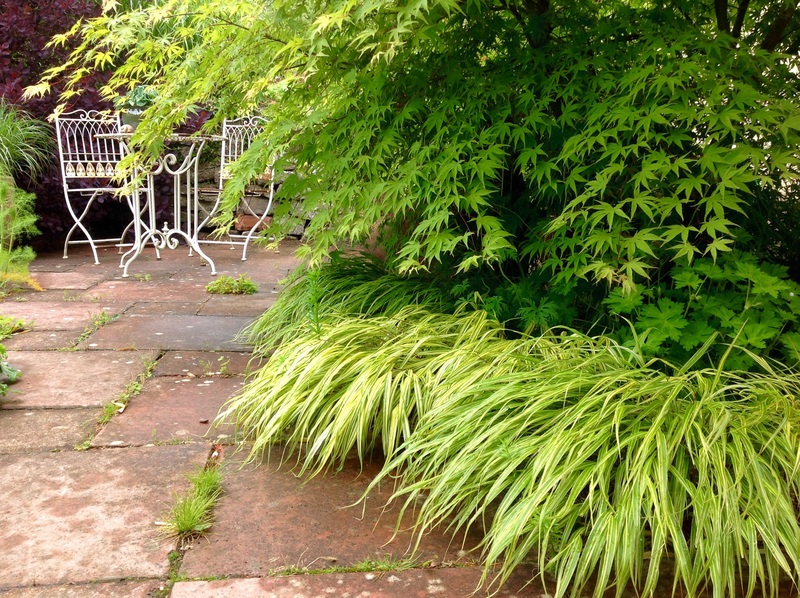 Elsewhere there is less suspense, Hakonechloa ‘Alboaurea’ in the sunken terrace, fringes the edges of the hard landscaping … … and elsewhere : either tumbling down the steps to the yard; or … … guarding the entrance to the vegetable garden and nursery. 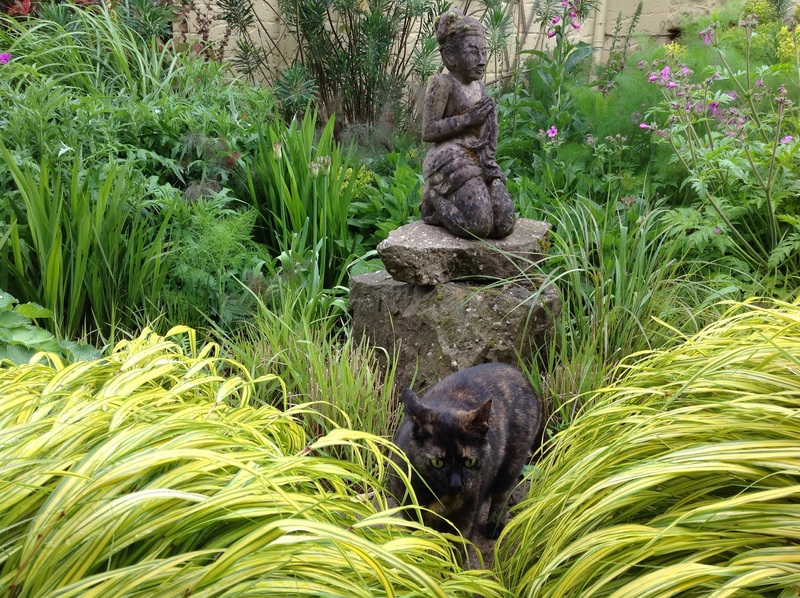 Plus, Lily, one of our naughty tortieshell cats, caught nibbling the ribbon-soft foliage. 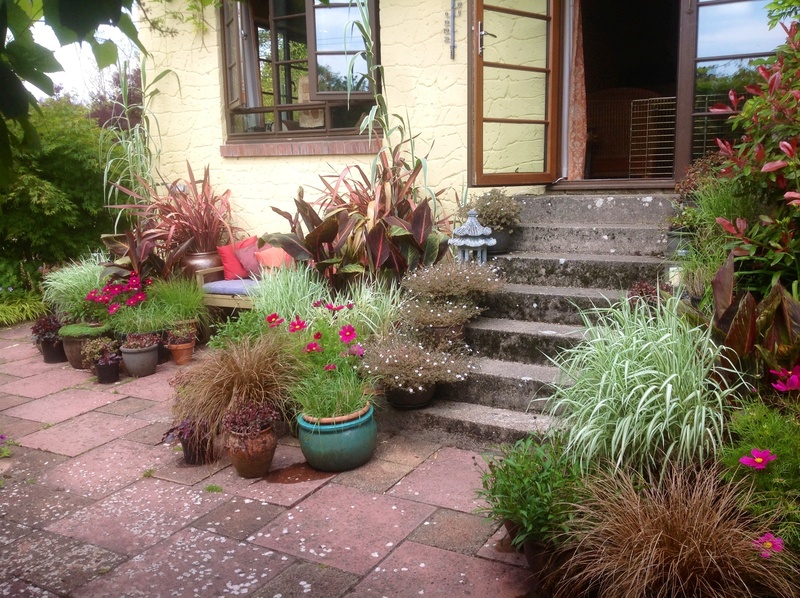 Lots of lovely grasses in pots, my favourites this June are the pair of Chionochloa flavicans flanking the terrace steps and framing the view towards the vegetable garden. 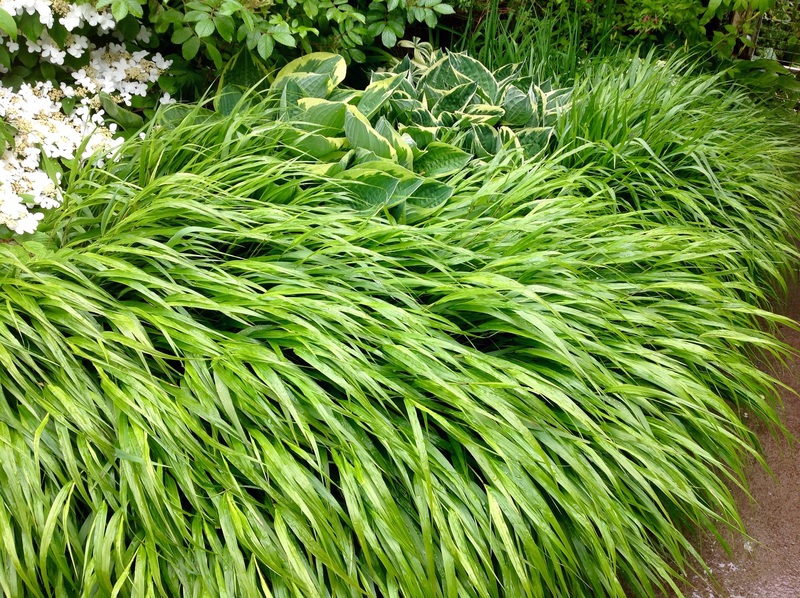 But there are lots of others that help fill out the hot border of potted tender perennials, especially nice to have while we wait for the cannas, ginger lilies and catalyas to get going. I think they’re waiting for balmy overnight temperatures. 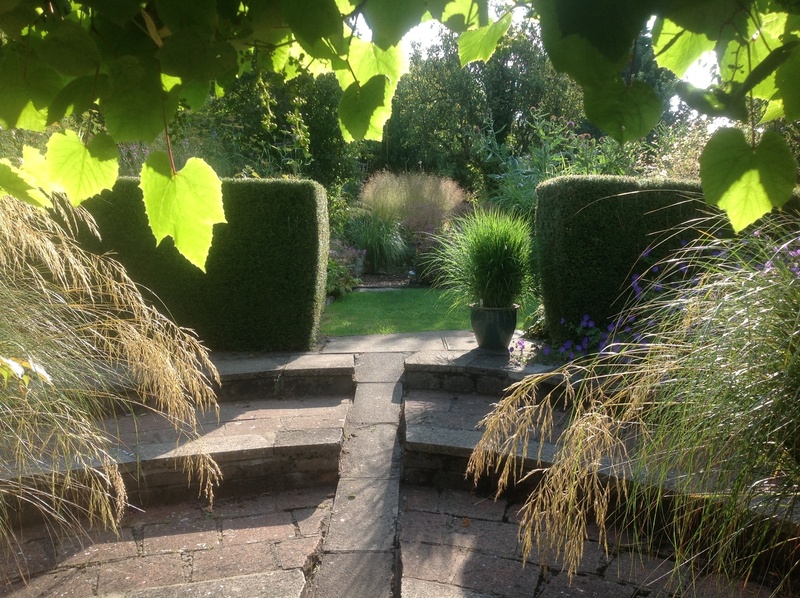 Chionochloa ‘Rubra’ growing happily towards maturity in the yard gravel garden, for me, slower to grow but much more reliable than bronze forms of carex in this garden. 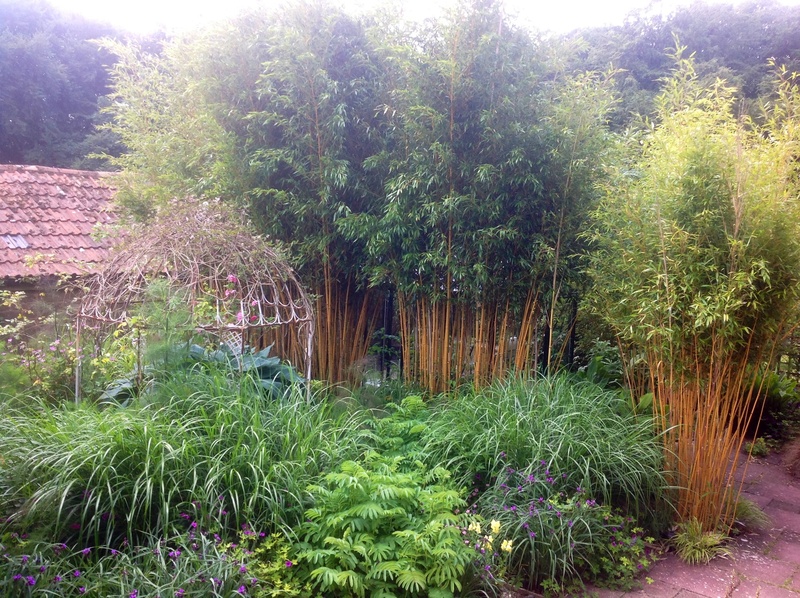 The giant bamboo Phyllostachys vivax screening the vegetable garden … … as well as more modest sized phyllostachys cloaking the view of the greenhouse. Rambling roses including a Kiftsgate wandering rather improbably along a wall top. 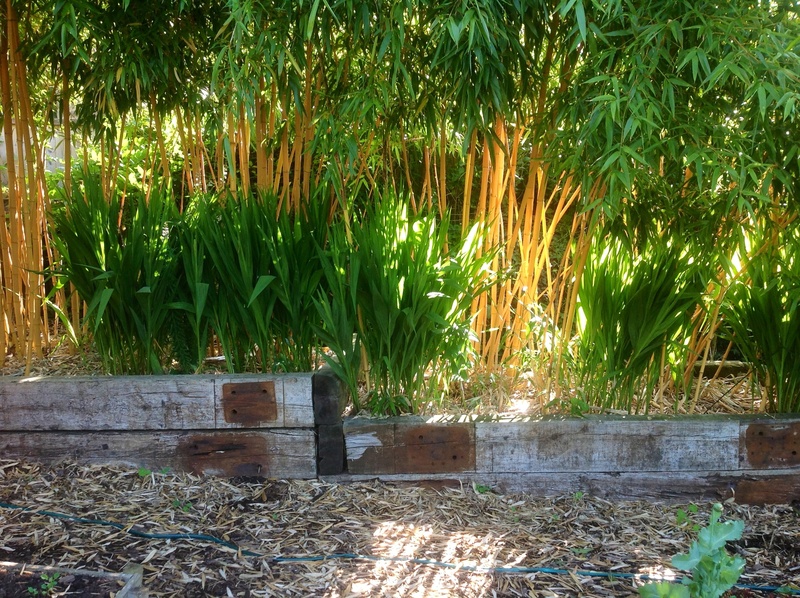 Yes, it’s a nightmare to prune. 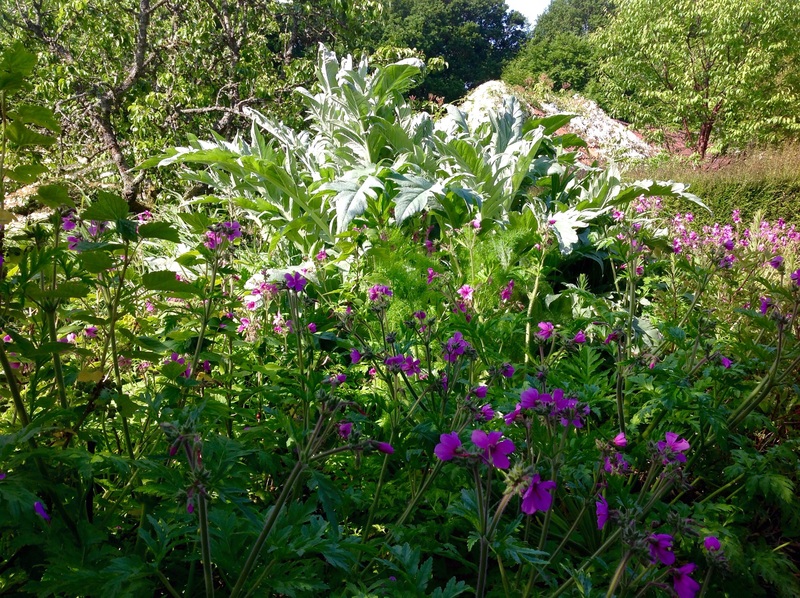 Masses of jolly geraniums, of course, including a riot of self seeded Geranium Palmatum bordering the vegetable garden and orchard, occasionally elbowed out of the way by the equally exuberant angelica or cardoon, all of them joyfully jostling for space. They are an unruly crowd. 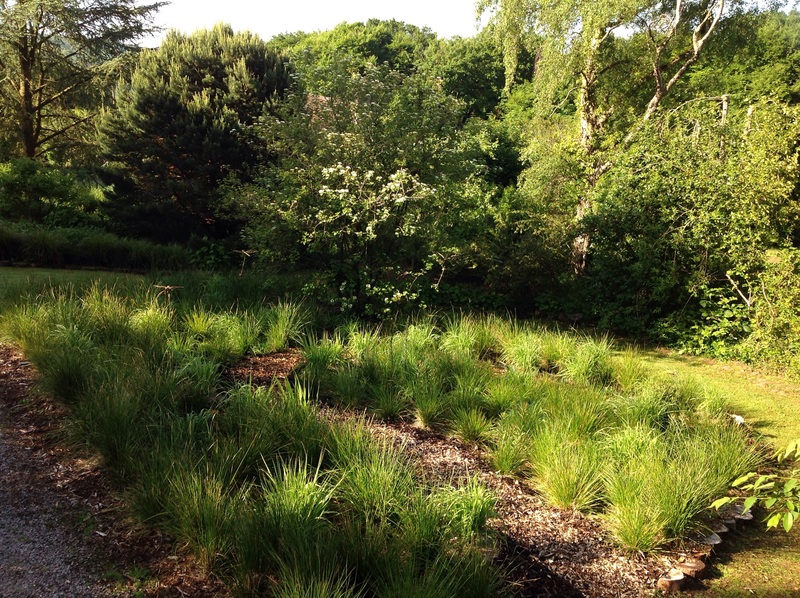 It looks like the seed raised deschampsia in the new mini meadow may be about to flower; the molinia and flowering perennials have settled in well, they flower later in the summer. 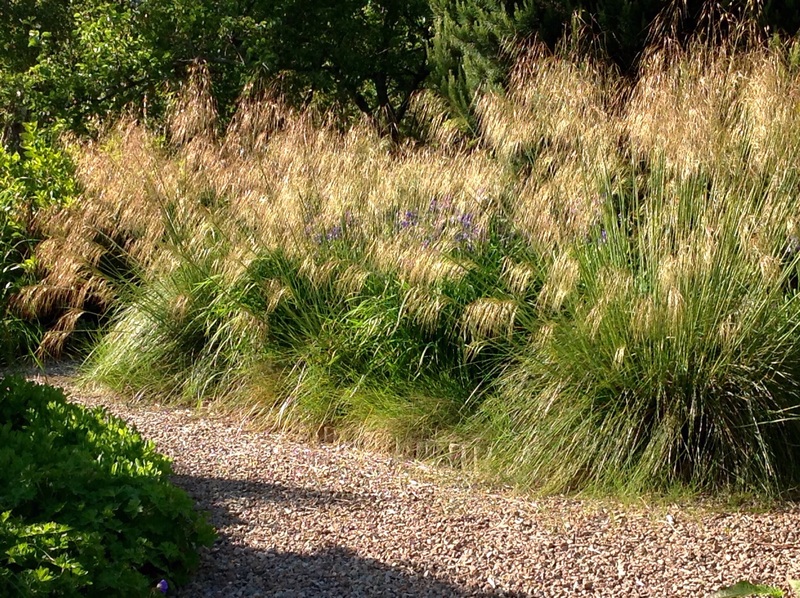 Rising mounds of glossy miscanthus foliage, full of late summer promise. And, of course, there’s lots of tea and cake, thanks to the cheerful help of the local Moravian Church, friends and neighbours. Paws crossed, we’ll have a fine day weatherwise; on previous rainy occasions we have been known to serve tea in the house ….